Up for grabs today are great little grab bags full of beauty products. There are products from Aveeno, Yes To Carrots, Nivea, Sally Hansen and more! 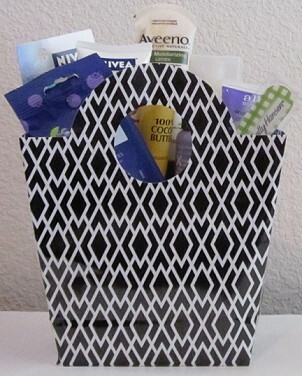 I was able to put together three of these bags just filled to the brim with all kinds of beauty supplies, so for this giveaway there will be THREE winners who will each receive a bag full of beauty products. To enter this giveaway, all you need to do is leave a comment on this post. Facebook and email entries will not count, so be sure to leave a comment on this post. One entry per person please. I will pick 3 winners at random when it ends. This giveaway will go until sometime late tonight – not sure when – but as long as comments are open you can enter! Who can’t use beauty products? You know how to make a girl happy!!! Sounds great for back-to-school time! This would be perfect since I’m on bed rest and have not been able to coupon shop and I go in for a c section in two weeks. Thanks. I love the grab bags!! I always love trying new things. Thanks! Looks like a very cool prize to win. Thanks for the opportunity. Look at all the goodies! Thank you for the chance to win! How fun is this one? Please pick me! What a fun giveaway!! yahoo!! Oh, it would be fun to get this in the mail! Goodies for the whole family. yay!!! I will take all the help I can get right now! thanks! Since my favorite thing at Christmas time is opening my stocking to see what goodies i get, this would be my second favorite! I Love beauty treats! would love to win, thanks so much for the chance!! Looks like a great prize/ thanks for the opportunity ! This would be great for a girls night in! Great giveaway. Love your site. Great giveaways. Thank you! Grab bags are so much fun! I could use some beauty right now. A beauty bag to beautify myself = yay! Something for me (for a change). Would love it.